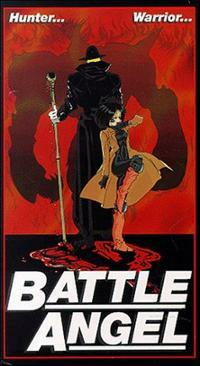 Battle Angel, directed by Hiroshi Fukutomi. Two 29-minute episodes. June 21, 1993. 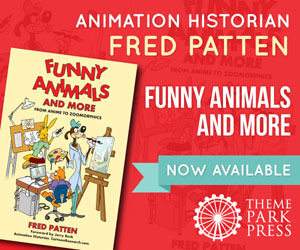 Usually I present the original Japanese title, then a translation of it, then the American title if that is different. In this case, it’s too chaotic to be coherent. The Japanese OAV title is arguably Battle Angel Hyper Future Vision GUNNM, with GUNNM being an abbreviation of “Gun Dream” (similar to the abbreviation of “Pocket Monsters” as Pokémon). The real original was a popular manga by Yukito Kishiro, collected and reprinted in 9 tankubon volumes. Only the first 2 of them were adapted for the OAV. The title of the manga and the names of the characters were different in the manga, the OAV adaptation, the American OAV by A.D. Vision, the British OAV by Manga Entertainment, and the American comic book by Viz Entertainment. The cyborg girl is Gally in Japan and Alita in America. The Floating City is variously Zalem, Salem, and Tiphares. The hunter-warrior with the flat hat is Gime and Zapan. In any case, the OAV has excellent art (if only okay animation) in Kishiro’s style, with character design by Nobuteru Yuki; and supervision by Rintaro, produced by Madhouse and Animate Film. According to the manga, the story takes place in 2533 A.D. near where Kansas City, Missouri was – the center of North America. The s-f plot of a future paradise city for the upper classes, floating or on a steel platform above the Earth and dumping its garbage on the ground-bound lower classes, was not new. A forerunner can be seen in The Dead Lady of Clown Town by Cordwainer Smith (1964). The Realms of Tartarus by Brian M. Stableford (1987) was set so far in the future that new “humans” evolved from rats, cats, and dogs in the shadowy forgotten Underworld. But Kishiro’s manga, and its OAV adaptation, were the first times that this plot had been presented visually. More recently, of course, there has been the August 2013 big-budget live-action/VFX movie Elysium, directed by Neill Blomkamp. The first OAV, “Rusty Angel”, opens on junk falling from the sky onto a vast scrapyard – some write-ups call this “the scrapworld”. A lone man, Dr. Daisuke Ido, a “cyberdoctor”, is looking for usable junk. He finds the head and upper torso of a robot that is still “alive”. He takes it to his home-workshop in Scrap Iron City to repair it into what looks like a young girl named Gally. Two other characters are his old friend, Mr. Ganz; and Yugo, a young handyman of Gally’s apparent age. Ido shows her why & how he has become a hunter-warrior; they have replaced the police, and capture or kill those anti-social killers who the Factory has placed a bounty on. He does it to earn enough chips to buy what he needs to repair the honest cyborgs. Gally tells him that she wants to become a hunter-warrior. He objects violently that he repaired her only so she could remain beautiful and innocent. She retorts that she’s not his pretty doll, and she senses that being a warrior comes naturally to her. Chiren is seen with another mystery man. She has been upgrading the quality of the gladiators in the Coliseum to earn enough chips to return to Zalem. Grewcica comes to her to get repaired and upgraded enough to beat Gally. 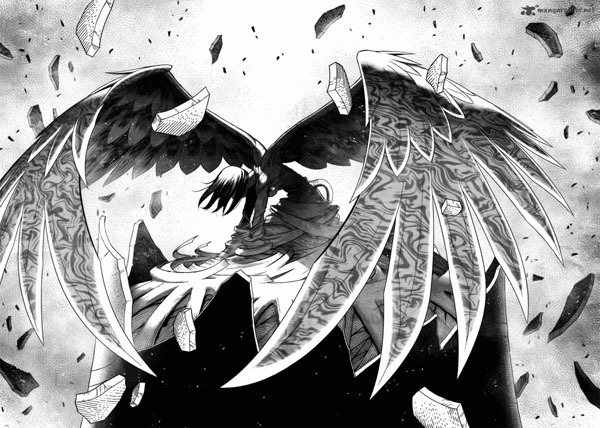 Chiren does not care about money; she just wants to hurt Ido by destroying his Gally. Gally goes alone to the Factory to have her hunter-warrior registration number imprinted on her brain by the Factory’s agent, No. 10. Ido is resigned to her becoming a hunter-warrior and takes her with him at night. He reveals that the tethers holding Zalem above Scrap Iron City are really tubes that carry luxury goods from the Factory up to Zalem. The killers harvesting spinal columns are revealed to be Yugo and a partner. On Ido’s and Gally’s way to a hunter-warrior hangout, Grewcica intercepts them and challenges Gally to a fight to the death. She accepts. Chiren reveals herself to be Grewcica’s partner. The man with the flat hat watches their duel. Gally wins. Chiren vows that she will never give up trying to beat and humiliate Ido. Gally promises that no matter how she may change as a hunter-warrior, she will always remain Gally. “Tears Sign” begins by showing Yugo and Tanji, his partner, as selling their spinal columns to Mr. Vector, who was the mystery man in Chiren’s bedroom. He is in charge of sending requested luxury goods up the tubes to Zalem, and also of supplying the Coliseum with winning gladiators. He assures Yugo that he will soon earn the 10 million chips needed to buy his way to Zalem, He offers Yugo the chance to make that total even sooner if Yugo will work directly for him instead of being a freelancer. Yugo is reluctant to give up his freedom. Conversation among Yugo’s neighbors outside his empty house indicates their disbelief that anyone can buy their way up to Zalem, no matter how many chips they have; and anyone promising otherwise is lying. Yugo is returned home, drunk, by Mr. Vector. He tells Gally his dream is to get to Zalem. She starts to amass enough hunter-warrior kills to get enough chips for Yugo’s 10 million. Yugo and Tanji pose as offering cyborgs to lube their gears with oil and Teflon, to get them alone to steal their spines. Gime, the man with the flat hat, poses as a customer to get them to reveal themselves. Yugo escapes but Tanji is killed after blurting Yugo’s name. Yugo telephones Vector for help while Chiren is in his office. Vector tells him to bring all his chips to his office. Vector then complains to Chiren that his Coliseum champions are now losing. He reads in a newspaper that Gally has become a leading hunter-warrior, and tells Chiren to bring her to him and he will send her to Zalem. He plans to make Gally a new Coliseum champion using Yugo. Chiren agrees, but is shown to have given up trying to outdo Ido. Gally tells Doc Ido that she is amassing hunter-warrior kills to go to Zalem with Yugo. Ido advises her to tell Yugo of her love for him. It is too late; they see a video bulletin that Yugo has been identified as a spine thief and murderer, and the Factory has put an 80,000 chip bounty on him. Gally, who doesn’t know that Chiren is following her, finds Yugo during a rainstorm. He has 9,500,000 chips; 500,000 short of 10 million. He tells her his life story and why he is so obsessed with reaching Zalem. Gally offers him 500,000 from what she’s earned. Chiren, who is listening, realizes their love for each other and is reminded of the love that she and Ido once shared. She leaves. Gally sends Yugo to Vector with his 10 million chips, but Gime has tracked him down and kills him. Gally and Gime fight in the rain while Chiren watches. 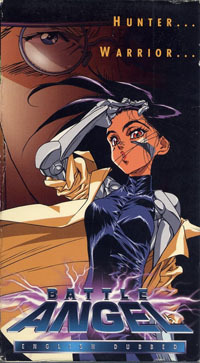 Gally uses the electricity in her cyborg body to call down a lightning bolt to kill Gime. 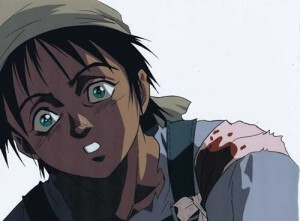 Gally brings Yugo’s head to Doc Ido and asks him to save Yugo. Ido builds Yugo a cyborg body just like Gally’s. 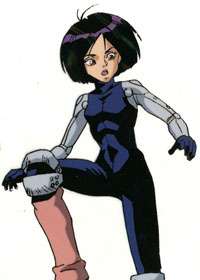 Ido credits Gally with saving Yugo’s brain, but she says that it was Chiren who kept his brain alive long enough to reach Ido. Chiren tells Vector that Yugo was killed by Gime and she doesn’t know where Gally is. Vector says that it is time to send her to Zalem. Ido tells Gally that Vector’s promise to send Yugo to Zalem is a lie; that Zalem will not accept anyone from the scrapworld for any price. Yugo overhears them and escapes. Gally goes after him while Ido goes after Vector. Ido bursts into Vector’s office and starts to beat him for luring Yugo to his death. He sees one of Chiren’s earrings on the floor and demands to know where she is. Vector has killed her and separated her organs to send to Zalem. Vector calls a super-gladiator to kill Ido. They fight, and Vector is accidentally killed. Gally searches for Yugo and sees him trying to climb up one of the tubes all the way to Zalem. She climbs after him and begs him to come with her, to find a new life outside of either Zalem or Scrap Iron City. Yugo appears to agree, but a defensive ring from Zalem intended tokeep the tubes free of rats kills him. Gally returns to Ido. 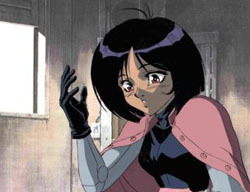 Battle Angel was one of the higher-class “forgotten” OAVs. It’s too bad the remainder of Kishiro’s manga wasn’t animated. But it may not be forgotten for much longer. James Cameron has had the rights for a live-action (presumably with lots of VFX) Alita: Battle Angel feature since 2000. 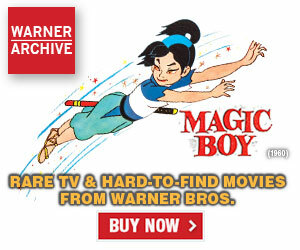 It’s currently scheduled for a July 20, 2018 release, if Cameron doesn’t get sidetracked producing Avatar sequels.